It’s that time again, gang. Another issue of the Film Noir Foundation’s magazine submitted for your delectation. I wasn’t planning on penning anything other than my Cocktails & Crime column for this installment, which riffs on the “noir in the arts” theme of this year’s Noir City film festival. But an opportunity presented itself that I simply couldn’t pass up. One of the most astonishing documentaries of recent years is Marwencol (2010). It’s about Mark Hogancamp, whose story fuses art and noir in an intensely personal way: after a beating left him with amnesia, he found a way to help heal himself by recreating his ordeal in a richly imagined fictional world, a 1/6-scale World War II town in Belgium. A new book dives deeper into Hogancamp’s life and art, and I talked to co-author and Marwencol producer Chris Shellen about it. Also included is a bounty of Hogancamp’s remarkable, hypnotic photographs. I’m thrilled Noir City is able to bring Hogancamp’s work to you. I recruited a few other contributors to this outing. Like my better half and other half of Renee Patrick, Rosemarie Keenan. A longtime admirer of the master of the American musical Stephen Sondheim, she sizes up his only original feature film script The Last of Sheila (1973) and suggests, in her “Noir or Not?” essay, that within this mordant inside-showbiz bauble beats the black heart you’d expect from the man responsible for Sweeney Todd: The Demon Barber of Fleet Street. In our “Prime Cuts: My Favorite Neo-Noir” section, crime novelist and country-western shirt connoisseur Martyn Waites appraises “one of the saddest, bleakest noirs ever made”: 1964’s chilling Séance on a Wet Afternoon. I discovered two of Richard Shepard’s early films while channel surfing, and each time made a note of the filmmaker’s name. Both Mercy (1995) and Oxygen (1999) boasted a white-knuckle energy in spite of low budgets, and featured accomplished performances from then-little known actors (Sam Rockwell and Adrien Brody, respectively). Shepard went on to become the poet of wrecked middle-aged machismo, writing and directing two crime dramas boasting career-best work from Pierce Brosnan (The Matador) and Jude Law (Dom Hemingway). In addition, he won an Emmy for his direction of the Ugly Betty pilot, is a principal helmer of HBO’s Girls, and makes a hell of a Twitter follow. In “5 Favorites,” Shepard offers the quintet of films in his personal pantheon. 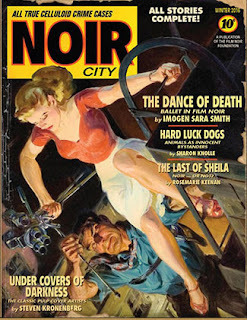 All that plus the estimable Imogen Sara Smith on ballet in noir, Steve Kronenberg on the classic pulp cover artists, a filled-to-bursting Noir @ Home section, and more. Donate to the Film Noir Foundation to receive your issue – and a chance to win the new Blu-ray of 1948’s Pitfall, with commentary by FNF honcho Eddie Muller. While I have you here, remember that Noir City Annual #8, collecting the best pieces from 2015’s run of the magazine including a few by yours truly, is now on sale at Amazon. That’s a veritable bonanza of noir goodies, so what are you waiting for?